Use your word-building skills to travel the globe in this combination of high-adventure and SCRABBLE fun. The Society of Puzzle Adventurers has a challenge for you: place letter tiles on richly illustrated maps to create a path around the world and return to their headquarters in London in 80 Days. Your valet, Hodges, is on hand to help and provide hints, but it will take a savvy lexicographer to pass this test. 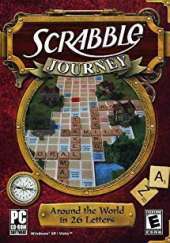 A completely new take on a classic family favorite, this features two game modes, original gameplay, a thrilling storyline, and all the fun you'd expect from a game called SCRABBLE. Features: Place letter tiles on richly illustrated maps to create a path around the world and return to your headquarters in London in 80 Days; Two Game Modes - Quest and Quick Play; Adventurous Gameplay based on Classic Fun; Bonuses and Rewards; Helpful Features and Hints.